So my buddy Screamin' Scott went to Placencia, Belize last week for a little vacation with the wife. He fished one day with a guide, his first saltwater day ever. He ended up with the grand slam photos below, in addition to one more permit and two more tarpon. I've never heard anything like this. Unreal... I told him to buy a lotto ticket. Fished the Truckee last Sunday & Monday. Sunday was the annular eclipse visible from that area. I guess it was an excuse for people to stand in the middle of the street and use three pairs of sunglasses to stare at the sun (because we all know that totally protects your eyes. Morons.) making me drive around them. Anyway, they started releasing water out of Boca so the lower river is a little colored and high but I still managed to hook some nice fish down there and the Glenshire stretch was great too with more manageable flows. I fished the Little Truckee for a few hours on Monday morning and got roughed up. Don't know what was up but I went back to the big river and started wailing again. All in all a great trip. Evidence of a good time below. The fish in the third photo was so fat and soft it looks like I'm squeezing the life out of her but her fatness is just actually engulfing my hand. Monday marked my first California brownlining experience. I fished the Napa River with Mike and his boy Joshua, who kept us entertained the whole time. Anyway, on this trip we rowed our pontoons around downtown Napa trolling and casting and stripping in the holes. We hooked a few small fish on the rising tides but later as we began to cruise back down river with the outgoing we started whackin' 'em pretty good on chartreuse/white and olive/white clousers. Nothing too big but we definitely hooked some fish that corked an 8-weight pretty good. All in all a great day brownlining as evidenced by the photos below. Just found this piece from the Seattle Times through The Drake website. It's a subject dear to my heart as a former Grande Ronde guide and angler as well as Save Our Wild Salmon volunteer for over a decade. I hope the documentary will make waves. It's great to finally hear someone with real government influence advocate removal of the four lower Snake River dams. Judge Redden is arguably the most well versed person in the world on this subject. He presided over the enormous case of the fight for removal of the dams, their violation of the Clean Water Act, Endangered Species Act, failed scientific plans of both Bush and Obama and he heard arguments for all sides for over a decade. It's actually a shame now that he is not in charge of the case, but again it's good to hear someone with his knowledge of the issues say the dams need to come down. It needs to happen and soon! All anglers should educate themselves on this issue, it's as big and important as the Pebble Mine, sacred headwaters mines and public access rights. This is the present and future our our fisheries. The Snake River dams, the subject of litigation between salmon advocates and hydropower supporters, ought to be removed, says the federal judge who until recently presided over the case. The federal judge who presided over a court battle that pitted Columbia River salmon advocates against hydropower supporters told a television interviewer that four controversial lower Snake River dams should be removed. In his first interview since stepping down from the case last fall, U.S. District Court Judge James Redden told Aaron Kunz, of Idaho Public Television in Boise, "I think we need to take those dams down." During the interview for a documentary to air later this summer, the Portland-based judge, who presided over the Columbia River case for more than a decade, said the government and the Bonneville Power Administration had made vast improvements for salmon by increasing the flow of water through the Columbia's hydropower system. They have "done things with the dams, spent a lot of money on all the dams, the Columbia and the Snake River — the spills, which they do not like — that has been very helpful," Redden said. But "I think we need to take those dams down." Redden seemed to imply that removing the Snake River dams could make a significant difference in the health of threatened and endangered salmon runs on the Columbia system. "Those four Snake River dams don't really get a lot of — it's not that needed," Redden said. The judge's comments, released this week by the station as part of a collaboration with Northwest public-radio stations, seemed to suggest he agreed with environmentalists and salmon supporters who have argued for years that salmon declines won't be reversed unless the dams are removed. The statements prompted immediate praise and criticism. "It's certainly a welcome announcement to see that's what he believes after basically studying this issue for 10 years," said Nicole Cordan, policy director for Save Our Wild Salmon. "It's reaffirming to have this very smart man who came to this issue unbiased and over the years has looked at the law and the scientific and policy choices and come to this conclusion. It feels good." But Terry Flores, with Northwest RiverPartners, a group representing farmers, electric utilities, ports and others opposed to dam removal, said she was taken aback by his words. "All of us who have been putting years, literally, into working together and looking critically at the science and frankly seeing these huge investments being made to change dam operations — we've been scratching our heads over why the judge seemed to struggle with endorsing the plan," Flores said. "But his remarks explain that he apparently had a certain mindset. He clearly harbored strong feelings about dam removal." My buddy Chuck, actually my protege who took over my position at Creekside Angling Co. in Seattle when I moved down here, sent me this fly and I have to say my heart skipped a beat as soon as it fell out of the package. I got a little light headed at the thought of getting a sharp tug in the midst of crashing waves on the CA coast. Makes me shudder now, writing about it. He actually grew up in the Bay Area and is very familiar with the striper game. And I'm amped to strap this sucker on and not get it stuck in my scalp as I try to launch it with a 10 weight (I hope it won't fold the rod like a cheap suitcase). After all stripers like big meals and I'd like to oblige them. Chomp! In keeping with the Truckee theme, I fished it and the Little Truckee the last two days. The weather was perfect and fishing was good. Saw some small, dark stones, caddis and BWO's but everything was under a bobber with a load of lead. The water was in great shape (about 500cfs at Boca Bridge) though with the weather now the graphs are on a sharp incline. The dam released water on the Little Truckee yesterday morning while I was on the water. It got dirty and fishing was no bueno after that. Good thing the main river was still in good shape. Though I didn't land either of the two jumbo pigs I hooked I popped some really nice fish. It was a great time. Here's some Sierra love. PS-Ignore the blurry spot on some of the photos. My camera is trying to die. So much for water/shock proof. Remember in elementary school when you had to do book reports? Man those were awful. "My book report is on Superfudge by Judy Blume." Looking back though we realize the value of learning to critically read, write and analyze. At least some of us do. 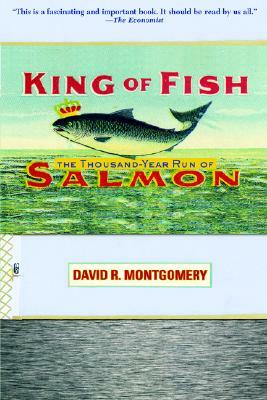 Hence my post today about a book I just finished but should've read seven or eight years ago, David Mongomery's King of Fish: The Thousand Year Run of Salmon. For all fly fisermen, gear fishermen and anyone interested in conservation this is required reading. But really this book is almost more important for those not familiar with salmon and rivers and the fact we are both directly and indirectly trying to extinguish them from the planet. Plainly written, you do not need to be a salmon scholar or scientist to understand this work. Montgomery beautifully and logically lays out the history of salmon, human interaction and the disastrous consequences that resulted. From Atlantic salmon in Europe in medieval times to the East Coast in colonial and modern time up to the present on the West Coast and the salmon crisis we are currently in he deftly shows the entirely human caused destruction of salmon everywhere. It shows the big picture. Montgomery identifies the key factors in the decline of salmon and even lays out a simple (yet in our pathetic political system a plan that seems almost an impossibility) for salmon recovery. It's a startling book even for those, like myself, that have been involved in and understand the environmental and political salmon wars in the Northwest. One of the most amazing this to me was as far back as medieval England people realized the importance of healthy salmon runs, laws were passed for their protection and laws continued to be passed in the New World as well yet they were simply ignored in large part and salmon runs continued to dwindle. The vast scale of wonton overfishing (or netting as it's really called) described in this book served only to reinforce my own view of the shame of buying commercially caught (or grown) salmon and supporting the maximum sustainable harvest mentality that has utterly failed. Read this book and you will understand the fall of salmon. But you will also understand the actions needed to begin the return and rise of the salmon and maybe with enough people and grassroots action we can reverse the current status quo and bring salmon back to sustainable levels. People and salmon can coexist, Montgomery shows us how, but we have to be willing to make sacrifices now for our benefit in the future. 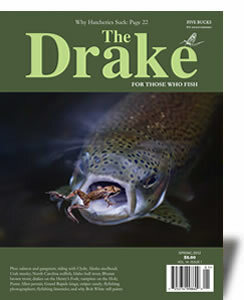 Yo yo, check out the latest issue of The Drake, Spring '12. It just hit your local fly shop this week. Editor Tom Bie and friends put out the best fly fishing magazine in the business. Hands down. I even have a short piece in this one involving vampires and steelhead. Keep it real. Go angle. So I caught a boot on Thursday. Seriously, a boot. A giant hip boot. It felt like I was in a Loony Toons cartoon. I drug it out of Putah Creek on 5x with a #20 Zebra Midge. It had obviously been there a while judging from the cased caddis that had made their homes on it. It tricked me for a second too. When I set the hook it moved just a bit, like a super jumbo trout that didn't really know it was hooked. Yeah. But I quickly realized it was a poor fighter. Here's my catch. You know, when I moved down to the Bay Area from Seattle people told me there wasn't much fishing around here, especially steelheading. Now, being from Seattle, I have steelheading flowing through my veins. The history, the fish, the rivers and uh,well, see, umm... The reality is, I grew up fishing steelhead but most of the rivers within a day's striking distance from Seattle are bogus. Yeah, there's certainly some good fishing to be had but over all, due to human influences, the Puget Sound fisheries are mere shadows of their former romantic histories. Not to mention the fact all Puget Sound streams are closed during the best part of the season. The Olympic Peninsula and Columbia/Snake tribs. in Eastern WA have some stellar fishing but (unless you enjoy falling asleep at the wheel) require all overnight trips. This all brings me to today, the 7th of March, when I drove and hour and fifteen minutes from my front door to feet in the American River, swinging a two-handed rod for steelhead. And, I landed my first California steelhead. It wasn't huge, it didn't make a bunch of blistering runs but it was wild and it was steelhead. That's something you cannot do this time of year while living in Seattle. The point of all this is, YES, there's plenty of fishing near The Bay. Anybody who believes otherwise hasn't done their homework, the plethora of fishing available is astounding. And YES, there are legitimate steelhead opportunities close to The Bay Area too. Get some! As for a report, the American is LOW, running at 1100cfs, very clear and low fifties water temps. A few people around but not crowded and yes, a few steelhead around too. The following photos are for all the haters. I love fishing in California!